Now that the FSMA deadlines for human food & animal food have arrived, compliance is not a ‘want’ but a ‘need.’ The FDA is beginning its visits of Human Food facilities and Animal Food facilities for 21 CFR part 117 and 21 CFR part 507 compliance! Compliance requires understanding the requirements, taking stock of how your program fits, and designing and implementing needed changes. How can a company get ready quickly if the compliance deadline has passed or is now less than a year away? 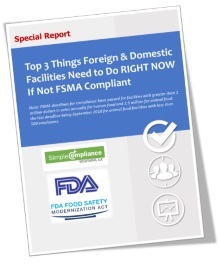 No matter where you stand at this moment, there are three things you can do right now to jump start FSMA compliance!